My Mom sent me this recipe. All Moms please, for all those little ones who have a difficult time with squash, try out this recipe. You will impress them, especially if you don’t tell them what this cake is really made of. I remember being a kid, many nights at the kitchen table, wishing that I had a house-dog who would secretly sit at my feet and eat my veggies for me, under the table, but instead, sadly; I was unfortunately forced on a nightly basis to gag each and every one of them down. Some of those veggies were really hard to take. One particularly gross vegetable for me at that time was squash; and squash, stone-cold, sitting there waiting for you, forever on the plate is even worse. Well kids, I finally found the answer. Brownies made from squash. Wow. I was born way too early. Where was this recipe when I needed it? Parents, this recipe is great, and travels to school well too. Getting children to eat vegetables was never easier. 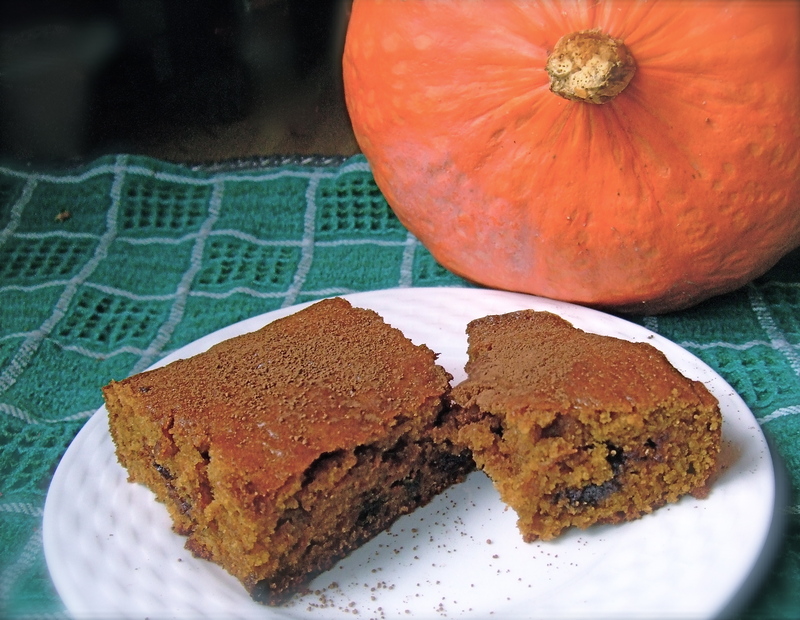 Chocolate helps bring out the sweetness of the squash in these delicious bars and the squash keeps them moist for days. In large bowl, stir together squash, brown sugar, buttermilk, oil, eggs and vanilla. Stir or sift together flour, baking powder, cinnamon, ginger, baking soda, nutmeg and salt; stir into squash mixture until combined. Stir in nuts and chocolate chips. Spread into greased 13- x 9- inch (3.5 L) pan. Bake in 350°F (180°C) oven for 35 minutes or until tester comes out clean. Let cool; cut into desired size. This can be topped with cocoa powder or chocolate icing. By the way kids, I have grown to love squash now, and make some real fun things with them, like mashed and baked with lots of butter and a bit of maple syrup, and especially squash fries with ketchup, which you must get your parents to make for you. Thanks Mom for finding this recipe for me and sending it to me to share with everyone. This entry was posted in Uncategorized and tagged Cake, Squash, Tasty Treats. Bookmark the permalink. Sure, go ahead and try it. The oil is a healthy light olive oil, but please make sure to use unsweetened applesauce, organic is best. Mmmm, you are so right about the cocoa powder. I am going to make some more with your variation! Thanks for the tip!